Today I’m collaborating with Anna from Actually Anna. 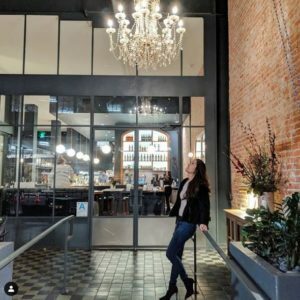 She will be sharing her top 5 places to eat in AMASTERDAM! Amazing right! go check her out. When you think of Los Angeles, you often think about the Hollywood sign, Rodeo Drive and Beverly Hills 91210. Though Southern California is full of amazing attractions one of the most popular destination to visit would be Santa Monica. Santa Monica is the perfect beach town with plethora of attractions with an easily walkable 8.3 square miles. This city offers a variety of wonderful things to do. 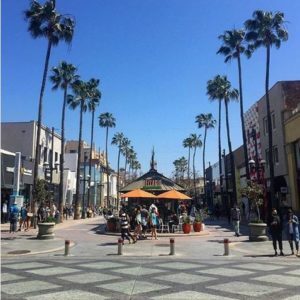 In fact, if you dig just tiny bit deeper you’ll probably end up in Downtown Santa Monica, a pedestrian’s paradise accentuated by the world-famous Third Street Promenade. One can easily spend a full day engulfed by the eclectic mix of street performers, shops and amazing food! 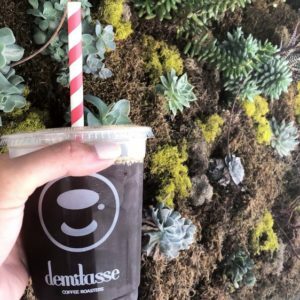 Demitasse Coffee has already 3 locations in Los Angeles and when discovered I popped in hidden and tucked away at the far end of the promenade (near Huntley Hotel) was the most patient and helpful baristas, with the most delicious coffee, better than Phil’s ! Try their Minty Cubano, incredibly refreshing and never sacrificing the flavor of the coffee! shopping is a destination because of the atmosphere, the smell of fresh sea salt water and the non-stop entertainment of just walking up and down the promenade. The recently added pseudo grass a long the promenade a few feet away from each store front with 4 lounge chairs and fun oversized blocks like Jenga to play with. A wonderous idea to help keep the husbands and the kids entertained while you focus on shopping! A very “LA” thing to do is visiting location with the most interesting gimmicky food. 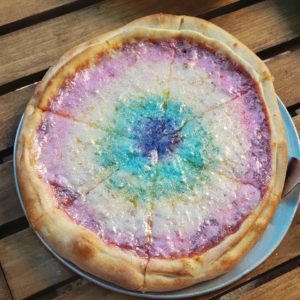 Venturing to Santa Monica from the Eastside (where I live) is almost a 1 and a half hour drive with traffic but to take a photo with a rainbow cheesey, glittery pizza – its completely worth the treck! 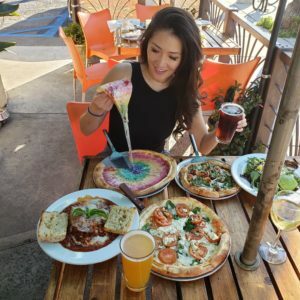 Dagswood Pizza is about 8 minutes drive, FREE parking ( unheard of in Los Angeles) and they serve a wide range of amazing Italian dishes, aside from the “Unicornaf” pizza. Truffle Fries and Truffle Pizza with a side of meat Lasagna and some beers in toll, while sitting outside on a perfect 79 degree day. 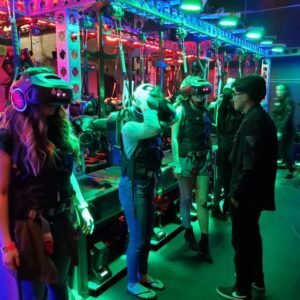 Venture back to the Promenade and you’ll find The Void- at first glance you might think its another Mall-like VR experience but this is above and beyond anything I have ever done. I truly highly recommend this to anyone and everyone. This 30 minutes immersive VR experience will make you feel like you had enter into a whole new dimension. 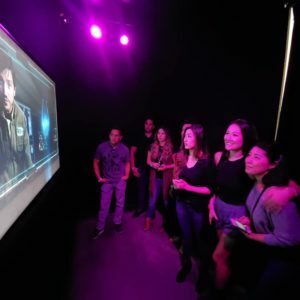 Each room fits up to 4 adults and you can interact with their avatars in the virtual world. Amazing! After such a work out it was time to replenished and get some sustenance, Massillia offers a very diverse classic tapas dishes. The restaurant has an amazing outdoor patio with huge chandeliers and comfortable sofa chairs and high table tops. 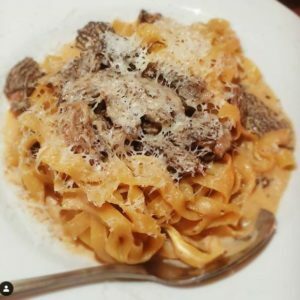 Perfect for a comfortable dinner with a date or just an evening with friends. The exuberant amount craft cocktails is a simple easy reason to visit again in the future. Good food, strong drinks and inviting ambiance is a sure reason to end the night with a grin on your face.